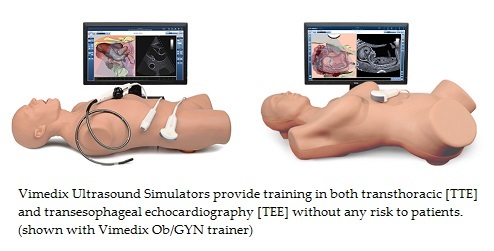 Simulation-based medical education (SBME) has revolutionized training in echocardiography. Anesthesiologists and critical care cardiologists are challenged by the need to deliver top-notch examinations, diagnoses and treatment using the latest protocols in echocardiography. Simulation-based medical education (SBME) has revolutionized training in this area. But, the question remains: Is there enough research and evidence to recommend a full integration of simulation-based training in echocardiography within medical education and accreditation programs? Simulators have been widely adopted into medical and surgical training. They have allowed the repetition of diverse scenarios -- high risk in some cases, rare and infrequent in others -- to improve performance at the clinical procedure. Ultrasound simulators, in particular, have expanded opportunities for learning and acquisition of intricate skills. Research explains how* the use of echocardiographic simulation can be an effective enhancement and accelerator to traditional training programs. It can be difficult to provide students with focused teaching while managing a live patient’s needs. But simulation can provide opportunities for dedicated teaching away from the stress of clinical interaction. The use of simulation to mitigate the risk of adverse events has long been used within the aviation industry. The appearance of simulators in medicine and surgery has proven likewise beneficial -- in particular for difficult clinical scenarios in acute and emergency care areas. The primary goal of simulation-based training is improved performance of the team and of the individual care provider to ultimately improve outcomes for patients. Validation of the simulation against reality is therefore essential, and [with the high level of augmented reality provided by high fidelity training models], surgeons have benefitted from shortened learning times, improved outcomes, and reduced complication rates. A clumsy or inexperienced trainee has the potential to cause significant patient harm. Ultrasound has now established itself as a tool whose use in various procedures performed in critical care and anesthesia, (for example, regional nerve blocks and central vein cannulation), improves safety for patients. The addition of echocardiography simulation to postgraduate curricula, accreditation, and fellowship programs will enhance and accelerate the theoretical and the practical components that produce competency. Feel free to share this content with others! *The above content is excerpted from the article, "Can Simulation Help to Answer the Demand for Echocardiography Education?" The American Society of Anesthesiologists, together with the Society of Cardiovascular Anesthesiologists and the American Society of Echocardiography, first established the process by which formal training and assessment enabled cardiac anesthesiologists to attain the necessary recognition to become high-level echocardiographers, and improve the perioperative diagnosis and management of cardiac surgical patients. The success of this achievement and its widespread adoption and international replication led the way for the development of critical care and postoperative physician-delivered echocardiography and the concept of general ultrasound in critical care.